Please Take Note: This is a review of the game’s final prototype. 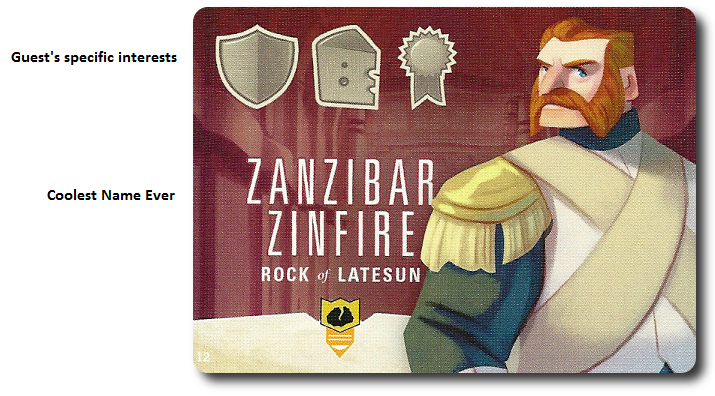 The art, game bits, and the rules discussed are all subject to change. The game is being reviewed on the components and the rules provided with the understanding that “what you see is not what you might get” when the game is published. If you like what you read and want to learn more, we encourage you to visit the game’s website or visit the Kickstarter campaign. Now that we have all that disclaimer junk out of the way, on with the review! Attract the most interesting guests to your party to be the talk of the town! To socialites, it’s very important to be seen at the right time, at the right place, wearing the right apparel. Just as important is who you are seen with. When it comes time to organize a large social gathering, getting the best caterer is just as important as getting the right guests. In this game, you must compete with other socialites to claim people of importance in hopes of creating the perfect party. The stakes could not be higher. Everyone of importance is watching and gossiping. Belle of the Ball, designed by Daniel Solis and to be published by Dice Hate Me Games, will reportedly be comprised of 60 Guest cards, 27 Belle cards, 3 Score cards, and 8 wooden discs (2 discs per player in 4 different colors). The final component count for the game is subject to change based on Kickstarter stretch goals. As this is a review of a prepublished game, we will not comment on the game component quality. The copy we were provided had excellent illustrations by the very talented artist, Jacqui Davis, who captured the game’s theme perfectly with vibrant caricatures of the guests. To set up the game, first separate the 3 different card types. Create a separate deck for the Guest, Belle, and Score cards. Shuffle the Guest and the Belle decks at this time. Second, randomly deal 3 Guest cards to each player face-down (or 4 if playing a 2-player game). These Guest cards will remain face-down for the duration of the game and are referred to as “Regrets”. Players should never turn these cards over or include them with any cards they have claimed during the course of the game. The “Regret” Guest cards will change hands, however. Third, deal out another 3 Guest cards to each player, but this time they should be kept face-up. These represent the guests who will be attending each player’s ball and are referred to as the player’s “Party”. Each Party is comprised of “Groups”. The players start with 3 Groups (each group is represented by one of the Guest cards). Players should organize their Groups in a line in front of them, face-up. Fourth, deal 5 Guest and 5 Belle cards face-up and in two parallel rows to the center of the playing area. These are referred to as the “Guest line” and the “Belle line”. At the top of the Guest line, place the Guest deck face-up and at the top of the Belle line, place the Belle deck face-up. 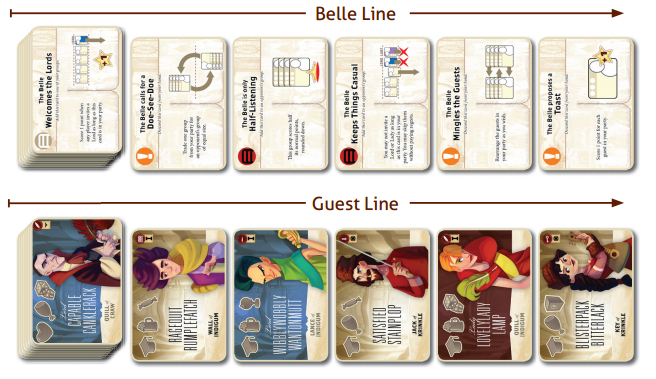 These are the Guest and Belle draw decks for the duration of the game. Leave room at the top of each of the draw decks for a discard pile. Fifth, take the Score cards and place them next to the playing area or assign to one player the responsibility of being the score keeper. The Score cards are double-sided and will have a series of numbers on them. Place the Score cards so that the numbers are in sequential order (1, 2, 3, 4, etc.). Sixth, have each player select a color and take the 2 wooden discs of their color choice. One wooden disc is placed in front of the player (to help keep track of who owns what color) and the other is placed next to the Score cards. These wooden discs will be used to keep track of individual players’ scores. That’s it for game set up. Determine who should go first and begin! Belle of the Ball is played in turns with no set number of turns per game. Each player’s turn is comprised of 3 sequential steps. A player’s turn is summarized here. Note that this step is optional. During the player’s first turn, they will skip this step due to not having any Belle cards in their hand. When a player does have a Belle card, they can optionally play one to the table, but only if they want to. A player is never forced to play a Belle card during this step. There are three different types of Belle cards. Instant: These Belle cards describe an effect that must be resolved immediately. Once the action is completed, the Belle card is discarded face-down above the Belle draw deck. Player’s Group: These Belle cards are attached to a player’s Group in their Party. Each Group can only contain 4 cards which can be a mix of Guest and Belle cards. If the Group already has a total of 4 cards, it’s considered “full” and no other cards can be attached to it. Opponent’s Group: These Belle cards are attached to an opponent’s Group. They work just like Belle cards that attach to the player’s Group and have the same restrictions. These Belle cards are also terribly unhelpful and will hinder a player’s opponent. During this step, the player gets to take 1 Guest or 1 Belle card from the Guest and Belle lines. The bottom Guest and Belle cards (those in the Guest and Belle lines that are the furthest from the Guest and Belle draw decks at the top of each line) are free. A player need only take one of the two cards they like. Every card above the bottom ones in the line, however, will cost the player a “Regret” Guest card. Thematically speaking, consider the “Regret” Guest cards as a polite refusal. Being a socialite, players can only refuse important individuals so many times before drawing unwanted attention to themselves. “Regret” Guest cards are always attached to a row in the lines. By playing a “Regret” Guest card, it allows the player to claim the Guest or Belle card in the row above it in the line. For example, the bottom card in the Guest and the Belle lines are free, but if the player wanted to collect either the Guest or the Belle card in the 3rd row up, they would have to play 2 “Regret” Guest cards. One to the bottom row and one to the row above the bottom row. Once played, the “Regret” Guest card stays with the row until a player claims either the Guest or the Belle card in that row. If the player takes a Guest card, it’s immediately attached to any open Group in the player’s Party. Unless otherwise stated by another card, a Group can have no more than 4 cards. If a player has 0, 1, or 2 Groups, the new Guest card can be used to create a new Group, but no more than 3 Groups per Party are allowed. If the player takes a Belle card, it’s added to their hand and can be played during step 1 on the player’s next turn. Any “Regret” Guest cards that were attached to the same row as the claimed Guest or Belle card are also claimed by the player and added to any other “Regret” Guest cards the player might have. Remember to never mix “Regret” Guest cards with any Guest cards in the player’s Party! A quick note on claiming Guests. When adding them to a Group, stagger them so each of the Guests’ personal interests are clearly visible. This helps keep count of how many Guests are in each Group and how many possible points the Group is worth. After any cards have been taken from either the Guest or the Belle line, the cards at top (those closest to the draw decks) are shifted downward (away from the draw decks) to fill in any gaps. If a line contains less than 5 cards, as many cards as needed are drawn and placed in the line until all lines have 5 cards. “Regret” Guest cards move with the Guest and Belle cards they are attached to. During this step, the player scores any full Groups they have in their Party. By default, a Group is considered “full” when it has 4 cards which can be a combination of Guest and Belle cards. Note that there are Belle cards that trump this rule. To score a Group, the owning player counts the total number of matched interests the Group has. A match is 2 or more icons found at the top of the Guests cards that are identical. A player scores 1 point for every match they have in the group. Any additional points given or taken by Belle cards attached to the Group are also scored at this time. The total score earned for the Group is then added to the player’s current score on the Score cards. The player’s wooden disc is moved as many number spaces forward as necessary until the total number of points scored for the turn are all accounted for. Once scored, all the cards in the Group are discarded. The left and right most Groups cannot be scored yet (not full). The center group scores 8 points! This completes the player’s turn. The next player in turn order sequence (traditionally going clockwise) now takes their turn starting with step 1 noted above. The game continues as noted above until the last Guest card is taken. Then each player counts the total number of Guest, Belle, and Regret “Guest” cards they still have in front of them and in their hand. The total number is divided by 2 and rounded down. The resulting number is the final points scored by each player which is then reflected by adjusting the players’ wooden discs on the Score card. For example, if the player had 7 Guest cards left in their Party, 3 Belle cars in their hand, and 2 “Regret” Guest cards in front of them, they have a total of 12 cards which is equal to 6 points (12 divided by 2 is 6). The player with the most points at the end of the game wins and has the best party with the best guests. Belle of the Ball has an advanced rule set, but it was not included in the rules provided with our prepublished review copy. Very little is known about the advanced play other than the titles found on the Guest cards (Lord and Lady, for example) and the country from which they hail are somehow used. Both the Guest’s title and country of origin are represented by icons as well as text. Additional information regarding any game variants will reportedly be published on the game’s Kickstarter campaign page. To learn more about Belle of the Ball, visit the game’s website or visit the Kickstarter campaign. Now here is a fast and easy to teach thematic set collection card game I won’t have a problem selling to the Child or the Parent Geeks. I don’t think the Gamer Geeks will have a problem with Belle of the Ball, but I’m having a hard time speculating what their overall level of enthusiasm will be. 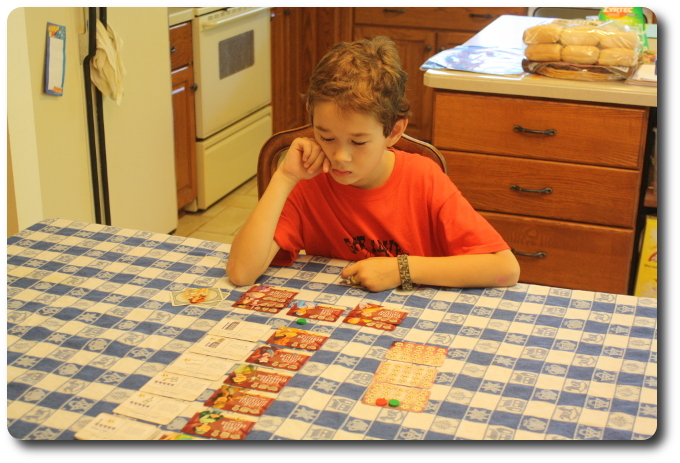 For the Child and the Parent Geeks, there is more than enough meat in the game to keep them occupied and engaged. For the Gamer Geeks, who are very familiar with many different game mechanisms and have logged countless hours of game playing time, Belle of the Ball is not bringing anything new to the gaming table. But the game rules and game play are solid, the use of tactics is a must, and a strategy must be formulated to obtain victory. That should hook the Gamer Geeks, but I need more time with the game before I can determine if the hook will set deep enough to reel them in. And, yes, I realize I just used fishing symbolism and lingo for a game about dancing. Teaching Belle of the Ball is very straightforward, but I do suggest you deal out a quick practice game to help demonstrate game play. This is necessary for two reasons. First, it’s sometimes difficult for players to visualize how cards shift from table to player. Second, the scoring will seem much less abstract (especially to the Child Geeks and non-gamers) if you demonstrate how Groups in a player’s Party are put together and scored. Other than that, the game is very elegant and minimalistic in its execution. Take 3 steps (or just 2) and that’s your turn. Rise, repeat, and dosey doe. After teaching the game to my oldest little geek, I asked him his thoughts on Belle of the Ball so far. Yes, at first glance, the game’s theme and illustrations do appear to be focused more on girls and women versus manly men who enjoy ninjas, explosions, and Chuck Norris. But theme and narrative do not play a significant role in the game. Put another way, I won’t be asking any of my players to consider which dress to wear, what music should be played, or ponder who Mr. Darcy will ask to dance. Time to give this game a whirl. The Child Geeks immediately caught on to how the Guest cards were collected and how the “Regret” Guest cards were used like currency to collect Guest and Belle cards further up the line. Where the Child Geeks were not as effective as they should have been was in the areas of strategic and tactical use of their Belle cards. I had to remind the Child Geeks many times that the first step of playing a Belle card was optional. They simply didn’t care. They used their Belle cards as soon as they could. This didn’t hurt the game, slow it down, or irritate any of the players. I would have preferred to see the Child Geeks use their Belle cards with a bit more thought, but they all played very well. According to one Child Geek, “Stop telling me to save the Belle cards. If I can use them, I’ll play them.” Fair enough and I quickly shut up. After the game and the dance was over, all the Child Geeks voted to approve the game. None of the Child Geeks (except the girls) were really that fond of the game’s title, narrative, or theme, but they had a great time playing it. Note that players do need to know how to read to play Belle of the Ball. This locked our younger Child Geeks out, but they were happy to watch, snicker, or do something else in the next room. The Gamer Geeks understood how to play the game within minutes and stress tested it fully by playing Belle cards, collecting large Groups, and scoring big points as fast as they could. The game’s theme went from elegant ballroom dancing to grunge mosh pitting. Belle of the Ball is a competitive game, but only as competitive as the players want it to be. The Gamer Geeks went after each other with everything they had and the game’s level of aggressiveness reflected that clearly. Most games took less than 20 minutes to complete due to the Gamer Geeks racing and punching each other at a fast pace. When the games were over and it came time to vote, the Gamer Geeks used words like “solid”, “fast”, and “good stuff”. 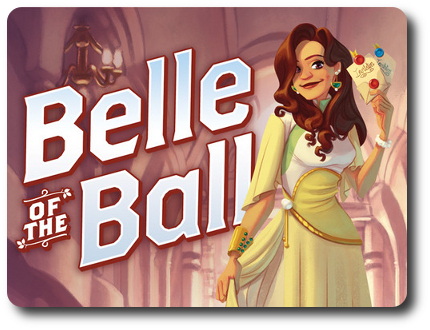 All the Gamer Geeks voted to approve Belle of the Ball and suggested it would be an excellent game filler or whenever a casual game was called for. Belle of the Ball was a lot of fun to play. Each turn is meaningful and the ability to trip up your opponents makes an otherwise run-of-the-mill set collection card game into a nasty bit of socialite guerrilla warfare. Players must think through the cards they are collecting and balance Belle card abilities with possible points. There is also a significant amount of risk each player needs to take in order to obtain a decisive advantage over their opponents. Not a great deal, mind you, but more than enough to make a few of our players bite their nails as the game progressed. At anytime, an opponent can slap a negative Belle card on you and cause Groups to crumble. So do you risk keeping a Group open in hopes of claiming more matches or do you close it as quickly as possible so you can collect what points you can? Do you spend all your “Regret” Guest cards to get a specific card, or do you save them for later in hopes the card you want will remain and become cheaper to obtain? There were at times a number of different directions I could take my game and that felt awesome. The game doesn’t feel big because it’s not big. This is a very small game, but it plays very well and there is sometimes a lot to think about. From the very start, everything made sense and I never once was left with questions. I had regrets o’plenty, however, and I’m not referring to the game cards. Belle of the Ball will teach all of its players the pain that comes with perfect hindsight. Luck doesn’t play any role in this game, which means the players are in control from the start. That’s very empowering and the game can be broken down into simple cause and effect actions and reactions. That makes it easy to trace the game’s progression and see what could possibly be coming up next. Pretty much everything is visible to the players. What will separate the novice from the master is using the information at the table to get the upper hand. I’m very pleased with Belle of the Ball. It played well with all our groups and left everyone satisfied. Dice Hate Me Games has another great game here and I’m pretty sure they know it. While the game didn’t sweep me off my feet or leave me breathless, I always left the gaming table feeling very happy. Give Belle of the Ball a play or two and I think you’ll agree it’s a good time and well worth adding to your dance card. Tagged Card Games, Child Geek Approved, Father Geek Approved, Gamer Geek Approved, Humor Games, Parent Geek Approved, Prepublished Games. Bookmark the permalink. I broke this game out for the first time recently and the game sort of played itself. None of the Belle cards gave us particularly big benefits, and most of the free Guest cards suited our sets just fine. I think I was the only one who took a Belle card, I scored the highest number of extra points I could with it, and still came second to another player simply concentrating on guests. Because most players were concentrating on guests, the game was over pretty quickly. No one wanted to play it again. What were we missing that would have made Regrets more exciting or encouraged us to draw more Belle cards? Did you and your group play Belle cards to your opponents’ groups? These act as negatives and force opponents to focus more on their own groups and guests. The step to play Belle cards is optional, so it might not feel like it is necessary and somewhat “automatic” if not utilized. Stump your opponents by putting Belle cards in their groups which reduces their points and forces them to split groups. That’s when things start to get interesting. I’d give it another try. Anytime I play a game for the first time and it just feels “off”, I am most likely missing something or my expectations are not realistic. Shuffle those cards and play aggressively at the dance. See if that makes the game more interesting. And try to play with a different group. Oftentimes, a group makes any game a fantastic experience or a trial. If none of this work, then it’s not the game for you, which is perfectly fine, because there are A LOT of games out there waiting for you to play.